Ultra comfortable soft black leather 2 seater sofa in classic modern Danish style featuring slim boxed armrests. Designed / launched by whom/when: Designed in 1970 by Erik Jorgensen at his mobelfabrik (that’s furniture factory in Danish) in Svendborg, Denmark. Today the company is run by his two sons Niels & Ole Jorgensen. Inspiration: minimalist modern comfort in true Scandinavian style. Fabrication: Solid timber frame, cylindrical chromed steel legs with brushed finish, supple black leather upholstery with 2 comfort bolsters for arm or lumbar support. 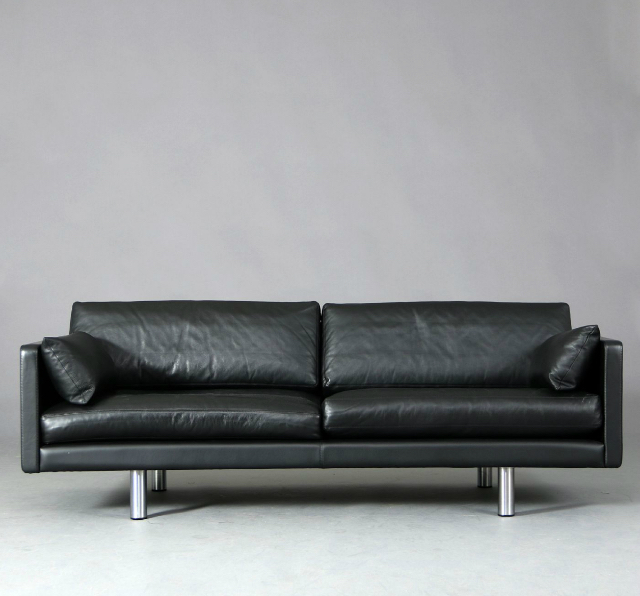 Design Consigned Stylist: Perhaps this is the ultimate black leather sofa for modernist and contemporary spaces. Will only get better with age. Design Consigned Collector: The EJ220/270 was first released in 1970. This sofa was made in 2001 and is in very good condition for its age, with no detracting faults. Authenticity: Purchased from Cult Furniture (then Corporate Culture) Sydney.